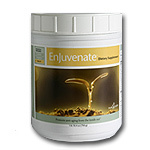 Mixing Instructions: One hour before bedtime, mix two scoops (50 g) of Enjuvenate with 8 oz. of ice-cold water, skim milk, or soy milk. Shake vigorously and drink immediately. Do not exceed recommended amount. Recommended Use: For adult use only. Use Enjuvenate three (3) times per week. For best results, do not consume any food within one hour before or after consuming Enjuvenate. Warning: Do not take if you are pregnant, lactating, have a medical condition, taking any medications, under a physician’s care, or allergic to soy protein, egg white, rice protein, or whey protein. Use only as directed. The body’s production of some of these molecules is very high during childhood and adolescence. Unfortunately, after age 20 the release of these products by the pituitary gland falls at a rate of approximately 14 percent every 10 years. By age 60, a loss of 75 percent or more of these compounds is not uncommon. The physical symptoms such as wrinkles, increased body fat, loss of muscle mass, loss of energy and other signs that normally accompanies aging can be linked directly to this decrease in the production of these important biomolecules. Secretagogues are supplements that work with your body to regulate the natural production of these important molecules. As the body creates more of these products, research has shown that many of the symptoms of aging may be reversed. Q. Can a child or someone under the age of 35 take Enjuvenate? A. Enjuvenate is not recommended for children or anyone under the age of 35. Q. Can I add hot water to Enjuvenate? A. It is not recommended because hot water can destroy the nutrients.